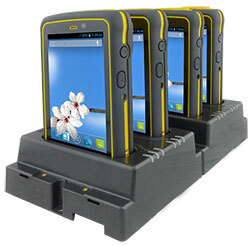 When Winmate initially introduced their E430 industrial PDA back in late 2011, the company knew it took a chance by designing the device with a large display, capacitive multi-touch, and also made it available with the Android operating system. Turns out Winmate's crystal ball was right. The E430 was a big success, and Winmate just introduced the latest generation of the platform, the new E430RM2 which includes a replaceable, externally accessible, and 50% more powerful battery. 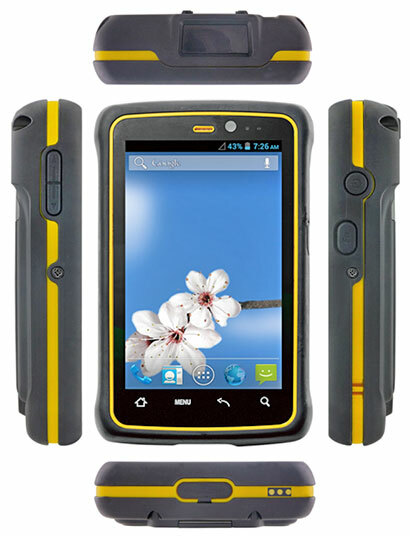 The E430 was always an exceptionally attractive device with simple yet elegant design and eye-catching black and yellow color scheme that set it apart from the utilitarian look of many industrial handhelds and PDAs. Its handy size, too, made the E430 a pleasure to own and use. Measuring 3.2 x 5.2 inches, and just over an inch thick, and weighing around nine ounces (plus/minus half an ounce depending on options installed) makes the E430 thicker and heavier than consumer phones, but its footprint is actually smaller than that of some of the latest big-screen smartphones. The new replaceable battery adds a bit of thickness and weight, but not much, especially considering that estimated battery life rises from 8.5 to 12-15 hours. The electronics of this latest E430 generation remain unchanged. There's still a 1GHz dual-core Cortex A9 processor, 1GB of SDRAM, and 4GB of eMMC storage via microSD card (expandable up to 32GB). The new E430RM2 is also still based on Android 4.1 ("Jelly Bean"), which offers full dual-core support. 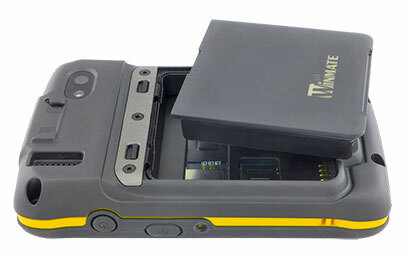 Despite its modest size and weight and the newly replaceable battery, the third-gen Winmate E430RM2 remains a remarkably rugged device. It can handle 4-foot drops to concrete without additional protection, it can handle a very wide operating temperature range of -22 to 140 degrees Fahrenheit. Sealing is at the IP65 level, which means the device is completely impervious to dust and can handle water jets from all directions. There is a small price to pay for having the removable battery: the second-gen unit could handle 5-foot drops and had IP67 sealing. One difference between consumer devices and those designed for deployment in enterprise and vertical markets that's often overlooked is the availability of supporting accessories and peripherals. For consumer devices, all that's available may be a USB charging cable — definitely not a solution that would work for rugged equipment customers. Winmate knows that and offers not only a dedicated dual battery charger that shows charging level, but also a clever daisy chainable charging dock.